This week, while the Fella and I put our feet up and recovered from all the walking we did at C2E2, we took some time to watch the next installment in our Disney Odyssey. “So… Where are we in the Odyssey?” wondered the Fella. “Uh, Dumbo is next,” I answered. Har, har. Homer is either rolling in his grave or he and Walt just high fived. I’m not sure. At only 64 minutes in length, it is one of the shortest Disney feature films. 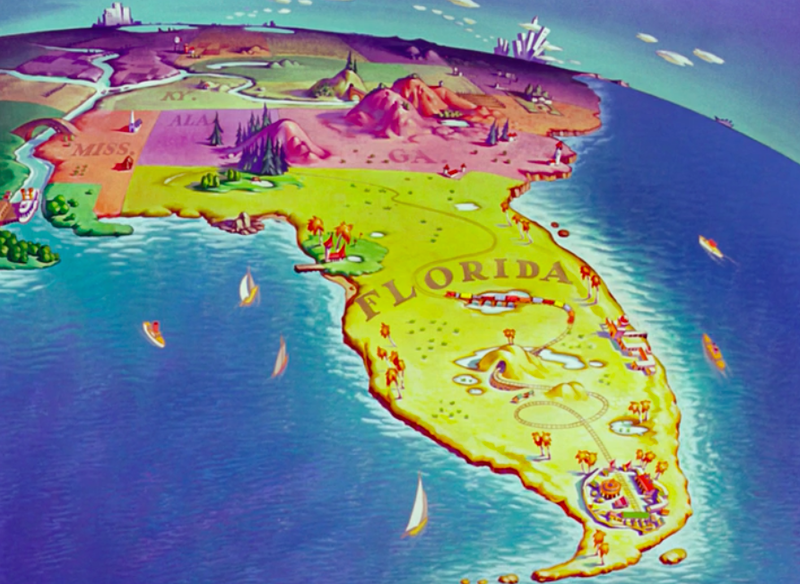 It’s also the first (and one of the few) Disney film set in America. The story of Dumbo was originally written by Helen Aberson and illustrated by Harold Pearl. It was designed as a ‘roll-a-book’ – a panorama-like toy prototype for stories. 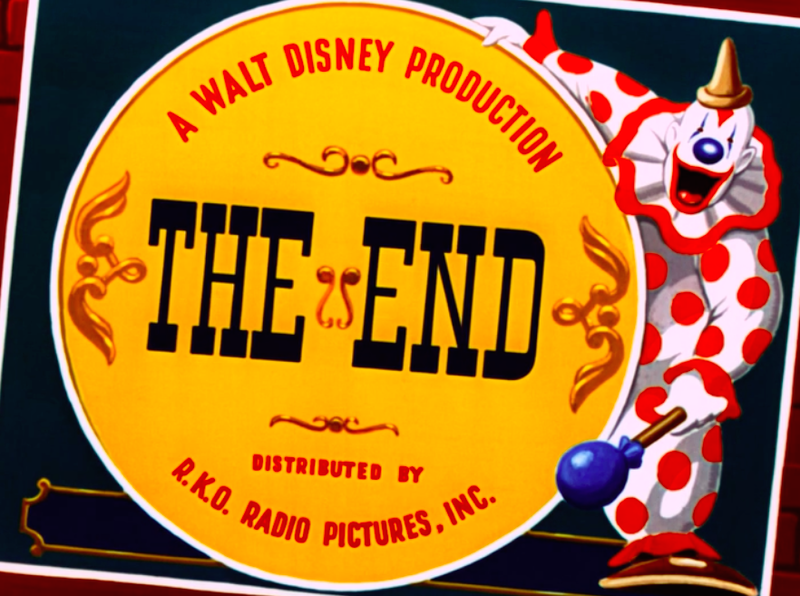 Walt loved the simple, heartwarming story and seized the rights in 1939. It was originally going to be a short, low budget film to help recoup losses from Fantasia and Pinocchio (womp womp) but Walt wanted it to be full-length. Despite WWII, Dumbo was relatively successful at the box office, grossing $1.6 million during the initial release. 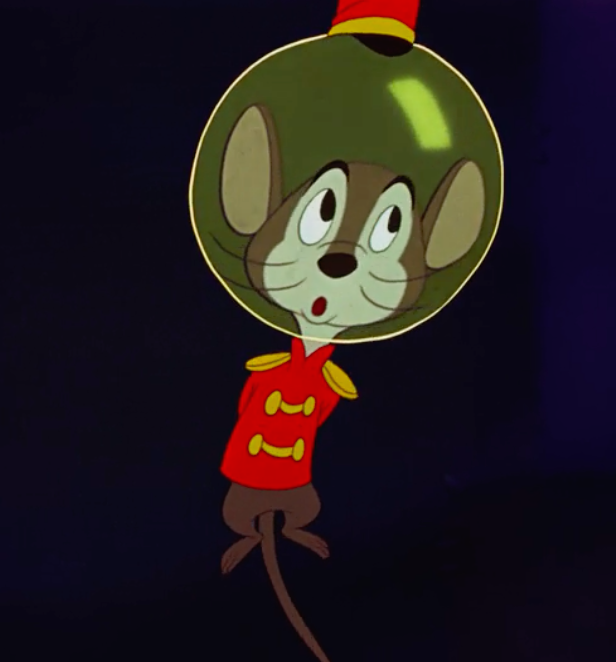 It won the 1941 Oscar for Best Original Music Score, but was also nominated for Best Song (for “Baby Mine” – saddest song EVAR) and in 1947 it won Best Animation Design at the Cannes Film Festival (d’awww)! 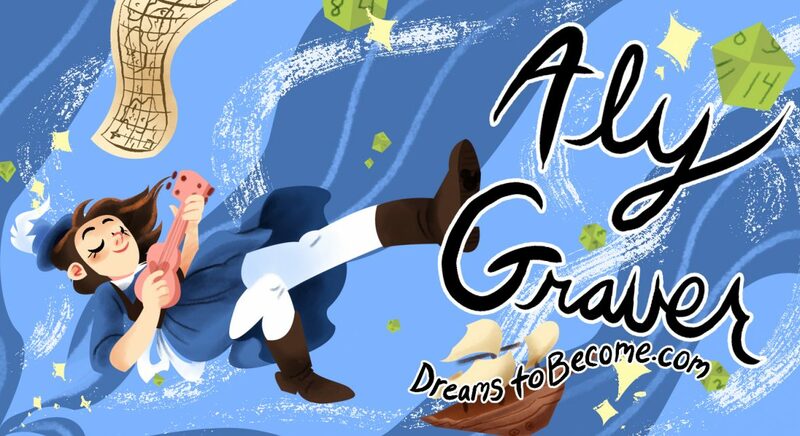 In July 2014, it was announced that Disney was developing a live-action version. No one was excited about this except for Tim Burton, who is purportedly directing the project. Again, no one was excited. Ahem. There was later some controversy (obvi) about the crows in the film as African-American stereotypes. 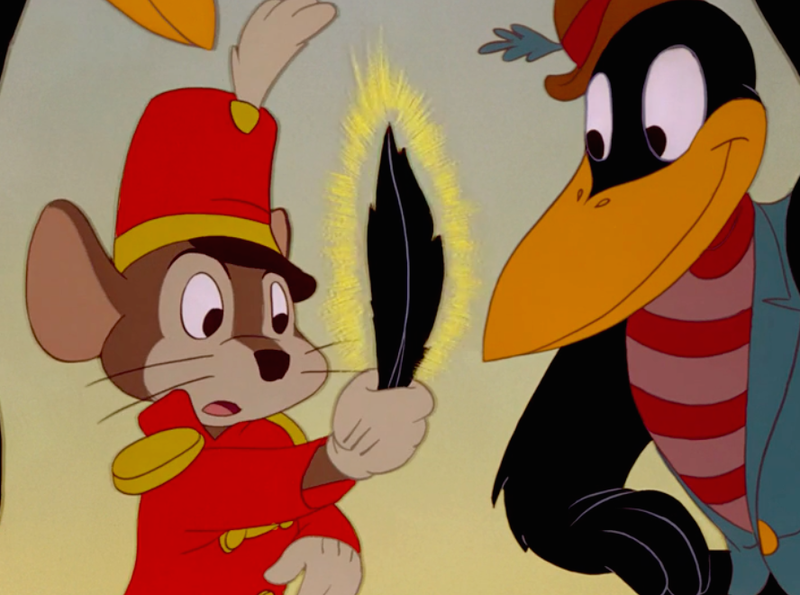 The main crow was voiced by Cliff Edwards, a famous vaudevillian/Broadway performer known also as “Ukulele Ike” (HOLLA AT MY PEOPLE) who was also the voice of Jiminy Cricket in Pinocchio. The rest of the crows were voiced by members of the Hall Johnson Choir, an African-American singing group. 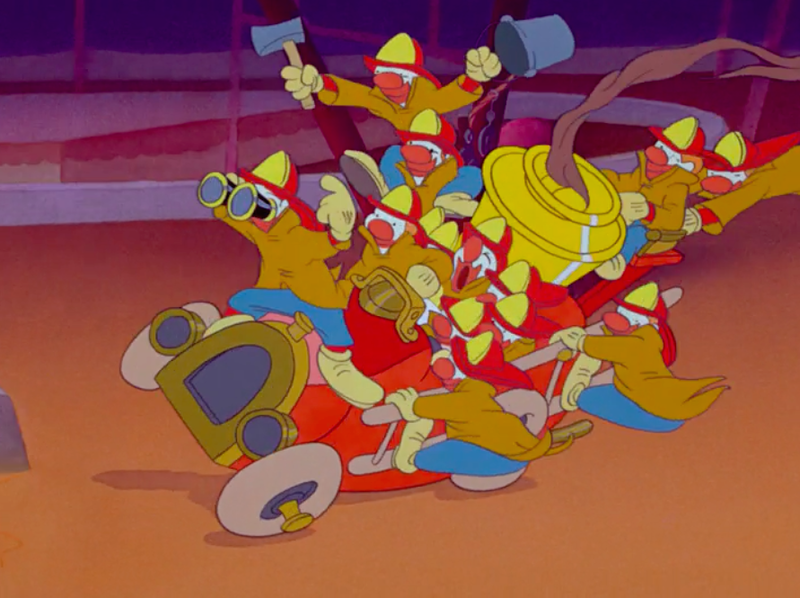 Some critics argue that the portrayal of the crows is not in a negative light, citing that they are sympathetic to Dumbo’s plight once they hear the whole story, that they are free birds who bow to no one, and their wit and intelligence are more significant parts of their characterization. I remember as a kid I thought the earth looked like this! As in, maps of the United States were superimposed upon the actual topography of our nation. Wait, is the stork…. is that the voice of Sterling Holloway? IT IS. Same voice as Winnie-the-Pooh and the Cheshire Cat, among others. I have always loved his voice, his little warm-and-fuzzy chuckles. These elephants are like showgirls! It’s all talk talk talk talk GOSSIP turn on a dime emotionally. 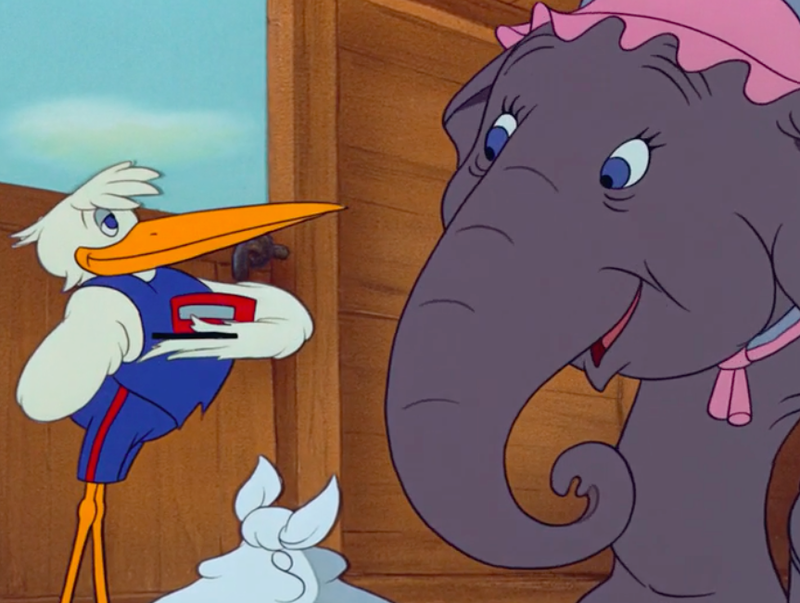 It’s weird that there seems to be no precedent for them being disdainful and excluding Mrs. Jumbo a bit even before Dumbo’s ears are revealed. Like, is it a sorority or something?? POOR MRS. JUMBO JUST WANTS A BABY SO BADLY. I feel awful for her. Wait where is Mr. Jumbo? Where are ANY of the male elephants? “These are Asian elephants, so the males would have tusks but not the females. Also smaller ears,” observes the Fella. During the part where they assemble the Big Top you can see a masculine-looking elephant or two but neither has tusks, so what gives? Aaaaaaand the circus workers are all black. Okeydokey. 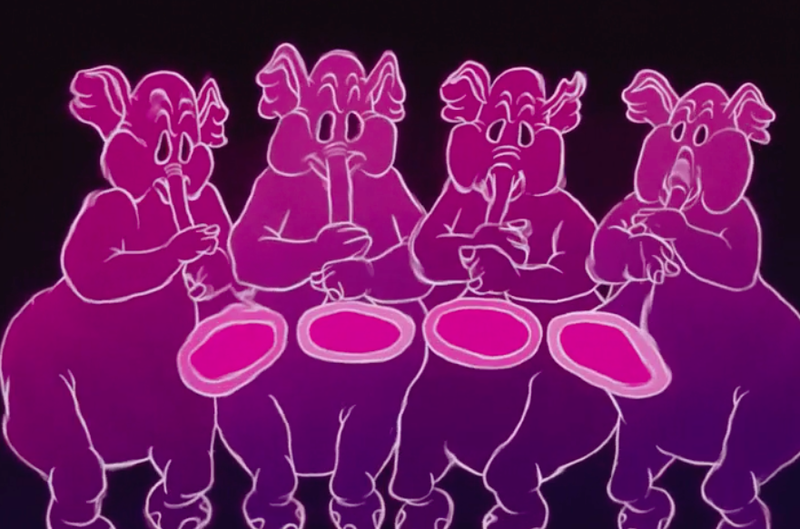 These hippos and elephants seriously are straight outta Fantasia. Straight up. All we need are an ostrich and an alligator now. I love the way the animals are dressed up for the big circus-has-come-to-town parade. I used to love their colorful headdresses and tassels when I was little. 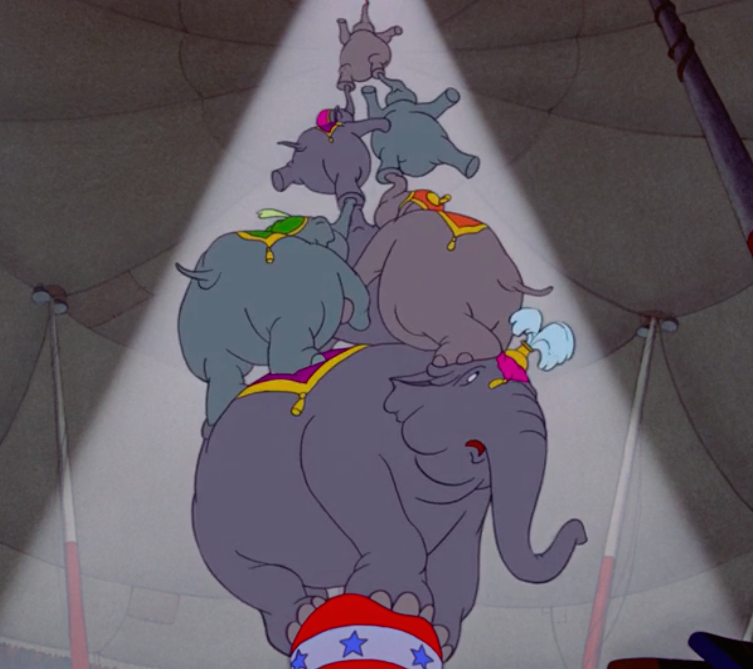 I know they used live elephants and other animals to model some of the animation on, but Dumbo himself appears to be modeled primarily after real babies. He looks just like my niece. Seriously, it’s so freaking adorable! Why are those boys allowed in the elephant pen? Where is the security? Who is in charge of chaperoning them? IN WHAT WORLD IS THIS A GOOD IDEA oh and now she’s spanking him. Welp. This is going to end well. Dumbo is just like Dopey, but a baby. See: tripping on long sleeves/ears, bashful expression, naive mindset. I remember my childhood jealousy for having a prehensile trunk like an elephant. It’s useful for bathtime, snacktime, performing, creative projects, bubble-blowing… so cool. Aaaaaand the Fella can’t stop giggling because they keep saying “climax.” The Fella: “It has a different connotation now! I can’t help it!” Admittedly, it is kinda funny. This clown sequence makes me cringe. There’s a lot of commedia lazzi in here, and they happen so fast I could hardly keep up! The fact that the clowns kinda don’t have real eyes freaks me out a bit. And then backstage they all have weird loud voices and they’re drinking champagne out of a shoe and… I think they just make me uncomfortable. Timothy Mouse realizes that depression is real and can affect all kinds of people, even a baby mutated elephant. Sad lullaby is sad. This is hands down the saddest, gut-punchingest chokehold-of-a-musical-sequence in Disney history…at least until Toy Story 2. Don’t even get me started. Timothy Mouse is world-weary enough that he should have realized that that bucket of water was really bubbly and smelled like booze. But he didn’t. And now they’re both trashed. “This is definitely a humor that caters to the adults in the audience,” says the Fella. I suggest that kids find drunk humor funny because it’s silly for no apparent reason. Adults find it funny cause they’ve either been that drunk before or they’ve seen someone in real life be that drunk before. oooOOoooo foreshadowinggggg….they do this with Sir Hiss in Robin Hood! Okay. Now. The Pink Elephants On Parade sequence. What the actual hell is going on? “Was that champagne laced with acid?” asks the Fella. I think I’ve cracked it: the boozewater looks a bit greenish in color… maybe the clowns were drinking absinthe, not champagne? That would account for the hallucinations much better than regular bubbly. Right? In any case, this whole thing is cleeeearly leftover from Fantasia again. I wonder why they put elephants in, instead of other various animals or even clowns or whatever. Is it simply because Dumbo is himself an elephant so that’s what they see? I dunno. Also is “pink elephants” a thing or did they invent it? TO WIKIPEDIA! Aaaaaaand the crows are African-American stereotypes. But the wiki was right – they aren’t servants or slaves, they aren’t negative stereotypes as far as I can tell, they’re just a bunch of guys hanging out and wondering how the hell an elephant and a mouse got into a tree that high up. And when I was a kid, I didn’t even notice the stereotypes, the crows were just clever and sassy to me. It was that simple. PINK ELEPHANTS IS TOTALLY A THING. It refers to hallucinating from being intoxicated, or delirium tremens. Jack London used it as early as 1913 in John Barleycorn. So now this all (more or less) makes sense (kinda)! The More You Know! Also known as alcoholic hallucination, “the horrors” and shaking frenzy. Sad violin while Timothy explains Dumbo’s story to the crows: “…and on top of that, they made him a clown! Socially he’s washed up…!” Welp, I’ll be sure to tell all of my Actual Circus Performer Friends that. He’s gonna need at least two wingfuls of these suckers to get any air, right? I still can’t believe that’s real fire in the clown firefighter act. Lawsuit. WAIT NOW IT’S OVER??????????????? It’s seriously over? I thought there was more! It’s hilarious to me that the things everyone remembers (the crows, the magic feather, learning to fly, etc) are all in the last 5-10 minutes of the film. It’s a total mind warp when you see it happen as an adult – it’s over so quickly! Commedia Bonus: approximately 10 – I didn’t count every single lazzi in the clown segments, but there’s a handful of ’em. Previous postCon Wrap-Up: C2E2 2015! Next postInspire and Admire: The Liebster Award! Seriously though, even Danielle-at-her-youngest recognized this circus was repeatedly throwing basic safety to the wall. Real fire and a pile of grown elephants on a ball. Sure. What could conceivably go DEADLY WRONG? I think this movie was Walt Disney working through some depression about how the reception to Fantasia didn’t pan out the way he wanted. It’s a gut-wrenching movie. And the happy ending is so abrupt and out-of-nowhere that it feels to me like an acknowledgment that happy endings can’t happen in the real world (or the entertainment industry, in particular).